1 A None No Power Seat 1 A is a standard recliner-style First Class seat that has slightly restricted legroom due to the bulkhead. There is no floor storage for these seats during takeoff and landing. The overhead bin above this row might be reserved for emergency equipment. 1 C None No Power Seat 1 C is a standard recliner-style First Class seat that has slightly restricted legroom due to the bulkhead. There is no floor storage for these seats during takeoff and landing. The overhead bin above this row might be reserved for emergency equipment. 1 D None No Power Seat 1 D is a standard recliner-style First Class seat that has slightly restricted legroom due to the bulkhead. There is no floor storage for these seats during takeoff and landing. The overhead bin above this row might be reserved for emergency equipment. 1 F None No Power Seat 1 F is a standard recliner-style First Class seat that has slightly restricted legroom due to the bulkhead. There is no floor storage for these seats during takeoff and landing. The overhead bin above this row might be reserved for emergency equipment. 10 A None No Power Seat 10 A is a standard Economy Class seat located in an Exit Row. It is designated as a Main Cabin Extra seat and may be selected for an additional fee. Seat back recline is limited due to the other Exit Row behind. However, there is additional legroom and additional personal space due to the limited seat back recline from the seat in front. The seat is missing a window-side armrest which may be bothersome. 10 B None No Power Seat 10 B is a standard Economy Class seat located in an Exit Row. It is designated as a Main Cabin Extra seat and may be selected for an additional fee. Seat back recline is limited due to the other Exit Row behind. However, there is additional legroom and additional personal space due to the limited seat back recline from the seat in front. 10 C None No Power Seat 10 C is a standard Economy Class seat located in an Exit Row. It is designated as a Main Cabin Extra seat and may be selected for an additional fee. Seat back recline is limited due to the other Exit Row behind. However, there is additional legroom and additional personal space due to the limited seat back recline from the seat in front. 10 D None No Power Seat 10 D is a standard Economy Class seat located in an Exit Row. It is designated as a Main Cabin Extra seat and may be selected for an additional fee. Seat back recline is limited due to the other Exit Row behind. However, there is additional legroom and additional personal space due to the limited seat back recline from the seat in front. 10 E None No Power Seat 10 E is a standard Economy Class seat located in an Exit Row. It is designated as a Main Cabin Extra seat and may be selected for an additional fee. Seat back recline is limited due to the other Exit Row behind. However, there is additional legroom and additional personal space due to the limited seat back recline from the seat in front. 10 F None No Power Seat 10 F is a standard Economy Class seat located in an Exit Row. It is designated as a Main Cabin Extra seat and may be selected for an additional fee. Seat back recline is limited due to the other Exit Row behind. However, there is additional legroom and additional personal space due to the limited seat back recline from the seat in front. The seat is missing a window-side armrest which may be bothersome. 11 A None No Power Seat 11 A is a standard Economy Class seat located in an Exit Row. It is designated as a Main Cabin Extra seat and may be selected for an additional fee. There is additional legroom and additional personal space due to the limited seat back recline from the seat in front. The seat is missing a window-side armrest which may be bothersome. 11 B None No Power Seat 11 B is a standard Economy Class seat located in an Exit Row. It is designated as a Main Cabin Extra seat and may be selected for an additional fee. There is additional legroom and additional personal space due to the limited seat back recline from the seat in front. 11 C None No Power Seat 11 C is a standard Economy Class seat located in an Exit Row. It is designated as a Main Cabin Extra seat and may be selected for an additional fee. There is additional legroom and additional personal space due to the limited seat back recline from the seat in front. 11 D None No Power Seat 11 D is a standard Economy Class seat located in an Exit Row. It is designated as a Main Cabin Extra seat and may be selected for an additional fee. There is additional legroom and additional personal space due to the limited seat back recline from the seat in front. 11 E None No Power Seat 11 E is a standard Economy Class seat located in an Exit Row. It is designated as a Main Cabin Extra seat and may be selected for an additional fee. There is additional legroom and additional personal space due to the limited seat back recline from the seat in front. 11 F None No Power Seat 11 F is a standard Economy Class seat located in an Exit Row. It is designated as a Main Cabin Extra seat and may be selected for an additional fee. There is additional legroom and additional personal space due to the limited seat back recline from the seat in front. The seat is missing a window-side armrest which may be bothersome. 26 A None No Power Seat 26 A is a standard Economy Class seat located in a last row of the aircraft. Seat back recline might be limited due to the wall of the lavatory directly behind. Also, if the seat back in front is reclined, then personal space will be reduced. The proximity to the galley and lavatory area might be bothersome. 26 B None No Power Seat 26 B is a standard Economy Class seat located in a last row of the aircraft. Seat back recline might be limited due to the wall of the lavatory directly behind. Also, if the seat back in front is reclined, then personal space will be reduced. The proximity to the galley and lavatory area might be bothersome. 26 C None No Power Seat 26 C is a standard Economy Class seat located in a last row of the aircraft. Seat back recline might be limited due to the wall of the lavatory directly behind. Also, if the seat back in front is reclined, then personal space will be reduced. The proximity to the galley and lavatory area might be bothersome. 26 D None No Power Seat 26 D is a standard Economy Class seat located in a last row of the aircraft. Seat back recline might be limited due to the wall of the lavatory directly behind. Also, if the seat back in front is reclined, then personal space will be reduced. The proximity to the galley and lavatory area might be bothersome. 26 E None No Power Seat 26 E is a standard Economy Class seat located in a last row of the aircraft. Seat back recline might be limited due to the wall of the lavatory directly behind. Also, if the seat back in front is reclined, then personal space will be reduced. The proximity to the galley and lavatory area might be bothersome. 26 F None No Power Seat 26 F is a standard Economy Class seat located in a last row of the aircraft. Seat back recline might be limited due to the wall of the lavatory directly behind. Also, if the seat back in front is reclined, then personal space will be reduced. The proximity to the galley and lavatory area might be bothersome. 4 A None No Power Seat 4 A is a standard Economy Class seat located at a bulkhead. The seat features additional legroom, however, full leg stretching might be limited by the bulkhead. It is designated as a Main Cabin Extra seat and may be selected for an additional fee. The tray table is installed in a fixed armrest, therefore, seat width is slightly reduced. Floor storage for personal items is not available for use during takeoff and landing. 4 B None No Power Seat 4 B is a standard Economy Class seat located at a bulkhead. The seat features additional legroom, however, full leg stretching might be limited by the bulkhead. It is designated as a Main Cabin Extra seat and may be selected for an additional fee. The tray table is installed in a fixed armrest, therefore, seat width is slightly reduced. Floor storage for personal items is not available for use during takeoff and landing. 4 C None No Power Seat 4 C is a standard Economy Class seat located at a bulkhead. The seat features additional legroom, however, full leg stretching might be limited by the bulkhead. It is designated as a Main Cabin Extra seat and may be selected for an additional fee. The tray table is installed in a fixed armrest, therefore, seat width is slightly reduced. Floor storage for personal items is not available for use during takeoff and landing. 4 D None No Power Seat 4 D is a standard Economy Class seat located at a bulkhead. The seat features additional legroom, however, full leg stretching might be limited by the bulkhead. It is designated as a Main Cabin Extra seat and may be selected for an additional fee. The tray table is installed in a fixed armrest, therefore, seat width is slightly reduced. Floor storage for personal items is not available for use during takeoff and landing. 4 E None No Power Seat 4 E is a standard Economy Class seat located at a bulkhead. The seat features additional legroom, however, full leg stretching might be limited by the bulkhead. It is designated as a Main Cabin Extra seat and may be selected for an additional fee. The tray table is installed in a fixed armrest, therefore, seat width is slightly reduced. Floor storage for personal items is not available for use during takeoff and landing. 4 F None No Power Seat 4 F is a standard Economy Class seat located at a bulkhead. The seat features additional legroom, however, full leg stretching might be limited by the bulkhead. It is designated as a Main Cabin Extra seat and may be selected for an additional fee. The tray table is installed in a fixed armrest, therefore, seat width is slightly reduced. Floor storage for personal items is not available for use during takeoff and landing. A variety of music selections are available and accessed through personal portable devices. A variety of film, television program, and video game selections are available and accessed through personal portable devices. The American Airlines Airbus A320 (320) seats 150 passengers and is primarily used on Domestic US routes. The aircraft is configured with 12 recliner style seats in First Class and 138 standard seats in Main Cabin Economy Class. 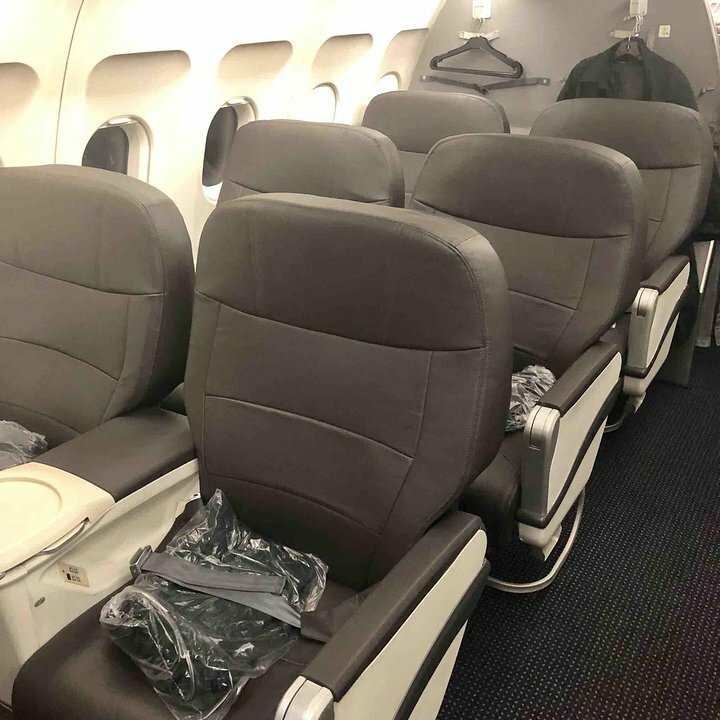 There are 18 seats in the Main Cabin offered as American Airlines' Main Cabin Extra that may be selected for an additional fee. These seats are located at the First/Main Cabin bulkhead and the Exit Rows. They feature additional legroom and preferred boarding. These are regular economy seats but these A320s seem more to have more leg room than the 737s. In the exit rows the tray table is installed in a fixed armrest, therefore, seat width is slightly reduced. Seat was fine, minimal leg room but not cramped on aisle seat. Cramped with passengers beside me. No internet service or entertainment on this flight - AA should have this for a 3 hour flight. AA should not have 60 min connection times for international flights, and have them on the other side of the airport. Luggage took way too long, and had to abandon it and run to make my connection. In Toronto, AA found my bag next day, kudos. Standard Domestic first Class. No meal on 1h45m OAK-PHX, just snacks/drinks - all I need at 6AM. Service totally depends on attitude of the attendants. Today: friendly and helpful (on my connection: Gina grumpy-pants) A decent deal for the price. Wall rib is right in my shoulder. I had no problems with this seat. Flew at night so really couldn't see out much. Very comfortable. leg room was fine. Flight was only just an hour and half flight. Seats are much more comfortable than AA 737 seats. Would highly recommend seeking the a320 over the 737. Overall not bad but not great. It gets the job done. I flew round trip from DCA-MCO on late afternoon/evening flights and found this seat to be pretty good, but there were a couple things that may have bothered other people, that weren't an issue for me. First, since I'm only 5'3, legroom isn't an issue for me, but even when I stretched out my legs I didn't feel cramped. Second and probably the main reason was that it was only a 2 hour flight. Since the flight was so short, neither me nor the person in front of me reclined. I didn't mind a lack of a USB or AC power outlet, though I probably would've on a longer flight. Service was typical for a 2 hour flight, as the FA's came around once for pretzels and drinks. The seat was wide enough and I would highly recommend this row for window lovers, as this row sports two windows. Overall, this was a good seat for a short flight, but I might consider upgrading to main cabin extra on a 4-5 hour flight. The seats must have gotten a new upholstering. They are pretty comfortable. Ridiculously small & little legroom for first class. No IFE or Power ports - and it was a newer plane - why does AA fly this junk? Offered streaming to personal devices in Y, but no one's feed worked, so little bandwidth. None of the seats on this aircraft, first class or coach, has power outlets. Beware if you're expecting to be able to recharge your device once on board. The seat was very cramped and I would have prefered to fly in 11D. Or the four aisle seats in the second exit row. However, the view from the seat was amazing. If you like taking pictures 14A has a great view of the wing and air. Flew economy Philadelphia-Las Vegas on a newly refurbished A320. What a difference ia refurb makes! The seats felt and smelled fresh in the smart AA dark grey upholstery. 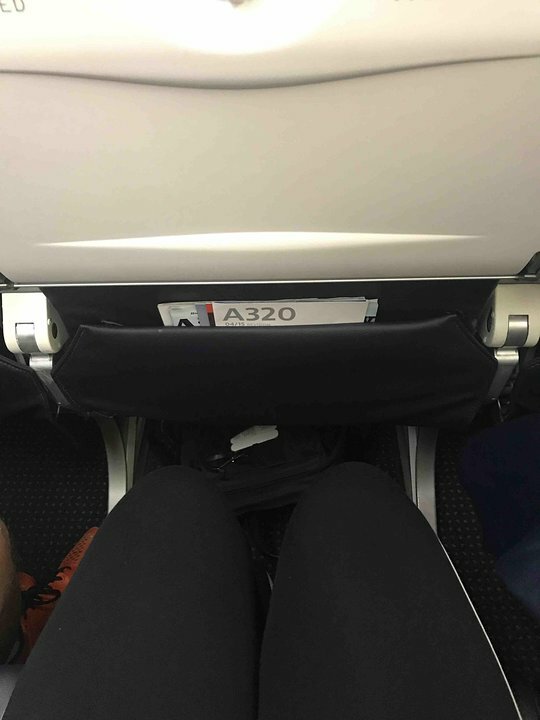 I'm 6'2 and there was plenty of room for my long legs when sitting. I had a real treat though as the flight was barely half full so all 3 seats to myself meaning I could lie across them and sleep for over 4 hours! There's still no IFE even after the refurb but wifi is available to buy on board. Complementary non-alcoholic drinks were offered and snacks available for purchase. Comfortable plane with good legroom. Only complaint is no IFE but other than that, good flight. While this A320 still has the original US Airways interior, it is more than satisfactory for a short 2 hour flight. Flying from PHX-SMF, I could have chosen to fly Southwest, but not only was the American fare actually cheaper at the time, but the seats are much more desirable. No IFE or power outlets, but these amenities really aren't all that important on shorter flights. The wi-fi at least tells me the time to destination, which is really all I need. 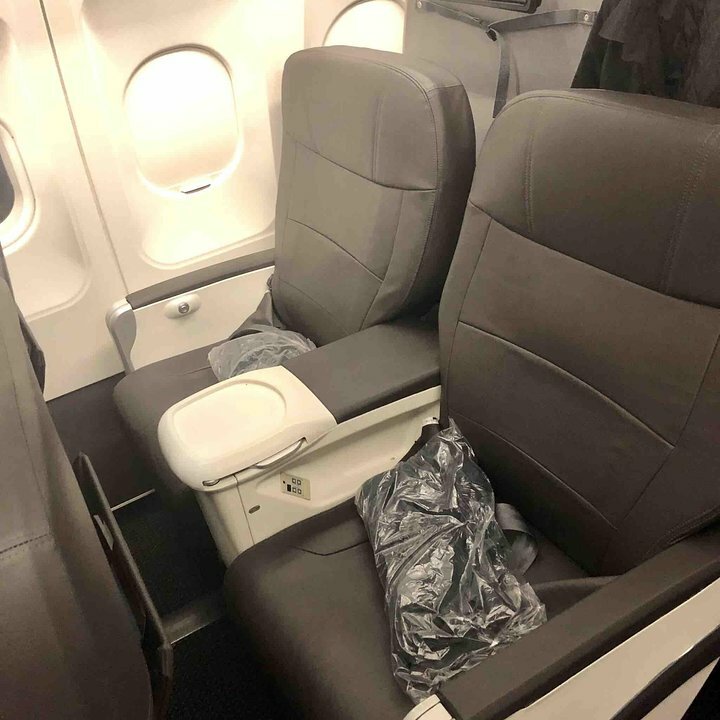 Seats behind the rere emergency seats on American Airlines A330-200 should be flagged as the emergency seats are used as a crew rest area with the seat backs pushed back for duration of flight and area curtained off making it a bit claustrophobic in seats 24A, 24B, 24G and 24H. We did not find the seat headrests to be comfortable at all. They were at a very uncomfortable height and angle for both my husband (6'2") and I myself at 5'5". In addition there wasn't any inflight entertainment available...no screens for movies! Very unusual on a 6 hour flight! Seat Legroom: I am only 5'6", so leg room was not an issue. I had no problem getting my personal carry-on item between my seat cushion and the seat back of the seat in front of me, and under the seat in front of me. Seat Recline: I did not use the reclining feature, the flight was too short for that to matter. Seat Width: I found the seat width to be comfortable for my slightly above average frame. This seat had one window, positioned slightly forward of my shoulder when I sat back in the seat. The fuselage panels did not obstruct movement or make leaning against the wall uncomfortable. Flew this red-eye flight from SEA-CLT; flighttime of 4h15. As with other ex-US Airways aircraft, the seats are a bit older but still comfortable and pitch is adequate. 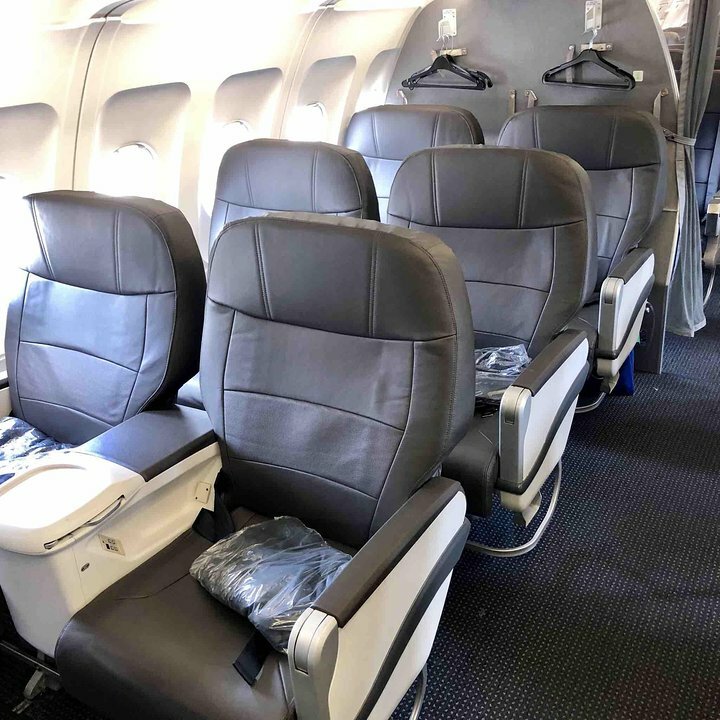 There isn't much recline on a standard economy seat- don't expect to get much sleep, but comfort and space-wise, it is fine for a multi-hour trip. No IFE or power, but apparently streaming vidéo is possible via the Wifi for a fee. Flew from CLT->SJO. This plane was an A320neo, and so it was VERY new, delivered maybe March 2016. Snack and drink cart came by twice on this four-hour flight, which is acceptable, but everything good is gone when they get to the back of the plane. SeatGuru says that they had 31 inch seat pitch but it seemed like a lot less. Good thing I am short so I had an alright flight. 22F had one full window and another one between 22F and 21F. Overall, well done American! Flew this plane on US Airways, very comfortable unlike Delta. 7F is a standard economy seat. Nothing special. If you want WIFI, buy the day pass for $16 BEFORE you go up in the air. Once airborne, AA wanted $40 for a one day pass on a flight from PHX to DCA. Always cheaper on the ground. Flew DEN to PHX. This seat was tolerable for the 1.5 hour flight only due to the fact that the person in front of me did not recline her seat. Very cramped feeling due to the tight seat pitch. This aircraft was still in U.S. Air livery. We can hope that American will add MCE seating. 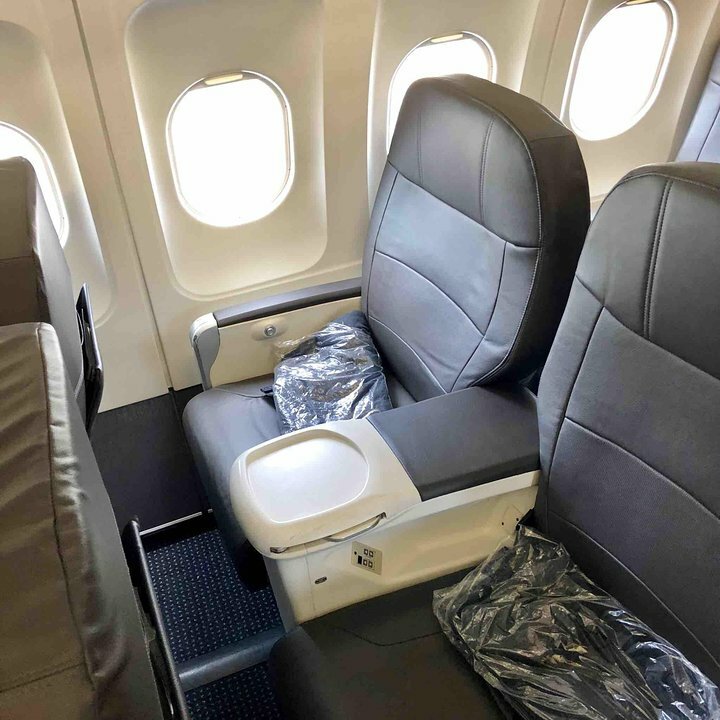 American Airlines flies 1 versions of Airbus A320.